One of the last bridges in Wales which charges motorists to cross will become free later. There has been a toll to cross the Cleddau Bridge in Pembrokeshire since it opened in 1975, linking the north and south of the county. But from 14:00 GMT drivers will be able to cross without paying. Scrapping of the tolls follows those on the two Severn crossings in December, ending almost a millennium of paying to travel into Wales. The first written reference to bridge tolls is in a document from the 12th Century outlining the Lord of the Manor of Tidenham's right to collect tolls for ferrying passengers across the Severn from Aust to Beachley. But it is thought the practice could even date back to Roman times. By the 18th Century, Wales was criss-crossed by turnpikes, the tolls from which were meant to pay for the upkeep of the roads. But in reality the operators were often corrupt, and tolls rose so rapidly that it was said the price of carting a load of lime out of Cardiff was 10 times greater than the cost of buying it in the first place. Side bars were introduced to catch farmers who only used sections of the roads between turnpike gates, greatly increasing the cost at a time when they were already struggling with high taxes and poor harvests. Dissatisfaction with the turnpike trusts peaked in 1839, when groups of farmers in mid and west Wales disguised themselves in women's clothes and began to rip down toll gates in a four-year campaign which came to be known as the Rebecca Riots. The demolition was often preceded by a ritual whereby the leader would pretend to be a frail old lady asking his fellow rioters to help move the barrier blocking his way. As a result of Rebecca, the Turnpikes act of 1844 amalgamated Welsh trusts and reduced tolls, though charges on privately-owned land continued to cause friction until the end of the century. At the end of July 1886 about 1,000 dockers in Cardiff's Grangetown rioted when Taff Vale Railway attempted to introduce a penny-a-man toll to cross a swing bridge on their land, which linked Penarth Road with Cardiff Docks. 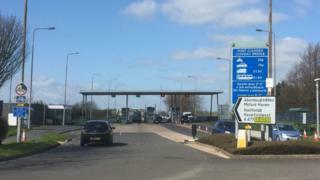 But transport expert Prof Stuart Cole believes the history of tolls in Wales is not all bad. On the 120th anniversary of the abolition of Wales' last turnpike at Llanfair PG on Anglesey in 2015, Prof Cole said: "Until the turnpikes, Britain - and in particular Wales - was entirely dependent on rivers and the sea for transport, but with the new roads Wales suddenly became important. "In the north, Thomas Telford's Holyhead Road - now the A5 - became vital in supplying troops to Ireland, and the time taken for mail coaches to travel to London almost halved, from 45 hours to 27. "In south Wales the new Tarmacked roads helped start the iron and coal industries. Whilst there wouldn't be mass extraction until the railways, the roads were significant in allowing equipment to be brought in to the coalfields to at least start the process of industrialisation." As recently as 2003, drivers had to pay a nominal 5p fee to cross the Porthmadog Cob, but with Cleddau goes the last major toll on Welsh roads. But Martin Johnes, professor of modern history at Swansea University, said they may well yet have a part to play in a sustainable future. "Severn Bridge tolls were sometimes blamed for contributing to much deeper and wider economic problems in Wales," he said. "In the 20th Century, resentment of tolls often owed much to how they were unusual. Not every bridge had them and very few roads did. This enabled them to be seen as unfair and inequitable." He added: "This unfairness has seen a general desire to end tolls whereas actually there is a strong policy case to be made for them in terms of discouraging traffic. "The threat of global warming demands a new generation of road tolls. Historically, they have been about recovering maintenance and construction costs. Now, they need to be employed to discourage car use."